June 20, 2016—Lake Kiowa, Texas—We are proud to announce that Lake Kiowa is being recognized for maintaining their status as an active Firewise Community recognized by the National Fire Protection Association, as part of their nationwide Firewise Communities/USA program. If you were not aware take note! Lake Kiowa is now one of the elite nine Texas Firewise communities that are celebrating 5 years as an active community, since their initial recognition in 2012. There are a total of 141 communities nationwide that have reached the 5 year mark. Texas currently has 78 active Firewise Communities and there are 1,302 communities recognized across the nation. Lake Kiowa is the only community in Cooke County to receive the Firewise recognition and is helping to set a precedence for other communities to work together and take ownership of protecting their homes and property from the threat of wildfire. A 5-year Firewise recognition ceremony was held June 20, at the Lake Kiowa Property Owners Association meeting. Representatives from the Texas A&M Forest Service presented a 5-year plaque to Lake Kiowa for their sustained efforts in maintaining their Firewise Community. 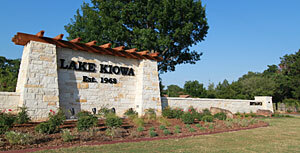 Join us in a big Congratulations to our Lake Kiowa Community! The Lodge at Lake Kiowa is the center of activity for our community members and guests. Regular dining hours in both the Tavern lovingly call "The 19th Hole", and the Restaurant makes your life here like a cool breeze. In addition to providing fine food in the restaurant and '19th Hole', the Lodge serves as a meeting place for many of the Lake Kiowa social clubs, service organizations, dances, entertainment and Sunday Chapel Services every month. As a resident or guest, the only choice you have to make each day is to decide to go and relax at any of the special events and activities planned for you by the staff. The eighteen hole PGA rated championship golf course is one of the many attractions of the Lake Kiowa community, and provides a rewarding experience for all golfers. The Lake Kiowa Golf Course features three sets of tees ranging from 6,605 yards at the championship tees; to 5,085 from the forward tees. This PGA rated course is easy enough for beginners but presents a challenge for more experienced players as well. Built by Leon Howard in 1969, this private course has decades of history and experience and is open year round for even the most dedicated golfers. If golf is your passion, then you must find out more about the course, the tournaments, and the in-house golf pro which is available to help at any time, and the pro shop is available for all your golfing needs. 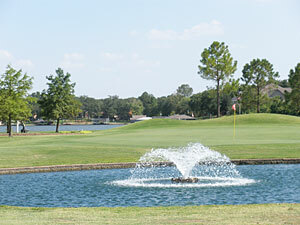 The course itself is equipped with USGA regulation greens, and a completely automatic sprinkler system using lake water. A full-time greens superintendent and grounds keeping crew maintain the course for your golfing pleasure, and tee times are listed on the Lake Kiowa website along with USGA rules, regs, handicap information and an on line handicap system for your convenience. Steve Brown, Dallas Morning News Real Estate Editor reports that North Texas home prices have risen by 14% in May of 2015. This would represent the largest year-over-year gains ever for this area. North Texas Real Estate Information Systems (NTREIS) and National surveys agree with Steve and report that according to data from the Real Estate Center at Texas A & M University and NTREIS and take it a step further, saying it is the largest one-month sales total ever for the North Texas region. Median home sales prices were also at a record $215,000 during May for preowned single-family homes sold by real estate agents, and total sales were up 6% from May 2014 with 9,484 properties sold.